software . . . NOW compatible with NTFS, Linux, and all other file systems. FAT, Linux, Novell, and ALL OTHER file systems! SpinRite 6.0 is now available for immediate purchase, upgrade, and download. This industry-standard data recovery tool is operating system independent, so it can be applied by users of Windows XP, 2000, Linux, and all other Intel/AMD PC‑platform hard drives and file systems. NEW SHIELDS UP! TEST: UPnP Exposure Test! Go to ShieldsUP! and click GRC's “Instant UPnP Exposure Test”. Is your employer, school, church, or ISP secretly SPYING on YOU? Please see our Password Haystacks online password testing page! You can follow GRC & Steve Gibson on Twitter! account is: @GibsonResearch If you would like to receive notifications of new freeware, newly available features of this web site, or Steve's work on CryptoLink (our forthcoming super-robust and super-secure VPN system) GRC's business-related news will be published though the @GibsonResearch corporate Twitter account. account is: @SGgrc If you'd like to know what's currently going on in Steve's head, learn of his discoveries, and in general what's happening (with many more updates than the corporate account) follow his personal Twitter account: @SGgrc corporate Twitter account. Quickly determine which state-of-the-art security features are being offered by your system's processor chip. Recent AMD and Intel processors contain three features which can be extremely beneficial to the system's overall security. 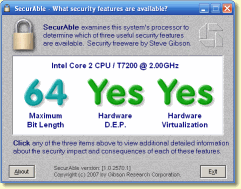 SecurAble probes the system's processor to determine the presence, absence and operational status of each of these three modern processor features. Click to jump to SecurAble's information and download page. DCOMbobulator allows any Windows user to easily verify the effectiveness of Microsoft's recent critical DCOM patch. Confirmed reports have demonstrated that the patch is not always effective in eliminating DCOM's remote exploit vulnerability. But more importantly, since DCOM is a virtually unused and unneeded facility, the DCOMbobulator allows any Windows user to easily disable DCOM for significantly greater security. Shoot The Messenger 2,429,408 downloads. Even before the latest DCOM/RPC vulnerability (see above), many Windows users were being annoyed by "pop-up spam" notices appearing on their desktops. This intrusion is also facilitated by an exploitation of port 135. Our free "Shoot The Messenger" utility furthers the security of Windows by quickly and easily shutting down the "Windows Messenger" server that should never have been running by default in the first place. A Critical Security Vulnerability Exists in Windows XP. (Surprise) Actually, as we know, there are many, but we'll handle them one at a time. This particular vulnerability allows the files contained in any specified directory on your system to be deleted if you click on a specially formed URL. This URL could appear anywhere: sent in malicious eMail, in a chat room, in a newsgroup posting, on a malicious web page, or even executed when your computer merely visits a malicious web page. It is already being exploited on the Internet. Our server generates maximum entropy, ultra high quality, guaranteed unique custom password material for your use when securing and keying your WEP, WPA, VPN, or other network systems. Since not all Internet servers are equally secure, knowing which server software a web site is using can be important to your security. Ultimately, the security of your personal data is your responsibility. This free utility can help. Wizmo is a lightweight "Windows Gizmo" offering a wide array of handy Windows commands. With a single click it can power down monitors, trigger a screen saver, set audio volume, and much more. Wizmo also includes an intriguing highly customizable "Graviton" screen saver. The most trusted and widely used utility ever written for mass storage data recovery and long-term maintenance. SpinRite is my masterpiece. If you don't already own or know about SpinRite, check out these pages. The future of your data could depend upon it. 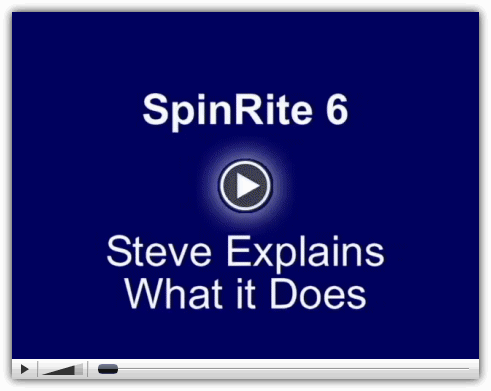 Here is an independent review of SpinRite 5.0, and here is Maximum PC's Feb. 2002 review. Ensure that your PC's personal firewall can not be easily fooled by malicious "Trojan" programs or viruses. Thanks to this first version of LeakTest, most personal firewalls are now safe from such simple exploitation. GRC.COM contains a great deal of content, to which my work continuously adds. Therefore, finding one's way around here can be a chore in itself. I maintain several comprehensive pages to help direct and acquaint visitors with this site's content, and to help them determine what's been updated or added since their last visit. You can be notified by eMail whenever these main pages (or any others) are changed. See this link for details. This page contains a chronological listing of the various projects I have completed, and those that are planned for the future. Most entries contain links to the section of this site where that work is described in detail. By browsing through what I have accomplished, both in the past and more recently, and where I am headed in the future, you can quickly develop a good feel for this entire web site. Everybody likes free software, especially when it's useful, small, and of the highest quality. Our freeware page assembles everything in one place, sorted by current popularity, historical popularity, or age since last update. Each entry contains a link to that program's section of this site, so it's a great way to view this site from the perspective of our free utilities. Purchasing SpinRite  Directions for immediately purchasing and downloading our commercial software. SpinRite documentation  You can learn about SpinRite by downloading its PDF documentation before, during, or after purchasing. Audio/video clips of my TV appearances  If a picture is worth a thousand words, a video clip must be worth a million. Are they worth the download? You decide. The worm wars of 2001  In the late summer of 2001, the Code Red and Nimda worms were a big concern. I spent some time analyzing their behavior. The Earthlink custom browser tag  Earthlink's customized IE web browser tags every web server request with some strange looking information. What is it? The "Patchwork" IIS server tester  In early March 2001, the FBI and SANS Institute asked me to create a quick patch verification tester and intrusion evidence scanner for Microsoft's buggy IIS web server. File downloader spying  My analysis of Real Networks, Netscape, and NetZip's file downloading utilities revealed that all downloads were being tracked and reported. OptOut: The original spyware remover  Big business may be using your Internet connection and computer to spy on you. I created the OptOut utility and web pages after discovering how prevalent this secret spying had become. FIX-CIH  Every April, the nasty "Chernobyl" virus wakes up to destroy many systems. The first time this happened I wrote a free & complete recovery utility. Sub-pixel font rendering with Free&Clear  Microsoft says they invented their "ClearType" technology, but I quickly and independently "invented" the same thing . . . as had others who came years before. It is very cool, but rather obvious. ZIP and JAZ drive click of death  Iomega's drives sometimes fall victim to a malady known as the Click of Death. Sounds bad, is bad. Learn what you can do about it, and get my free "Trouble In Paradise" (TIP) early warning utility. To keep an eye on important GRC news and announcements of new services, updates, freeware and commercial software, and also to follow along with Steve's ongoing work, you are invited to subscribe separately or together to GRC's and/or Steve's blog, Twitter accounts, and RSS feeds. The link about will take you to a page describing your options. Linking to this site from others.